Urbanization is a widespread and growing component of global change. Most past research has focused on its ecological effects with few studies assessing evolutionary responses to urban environments. 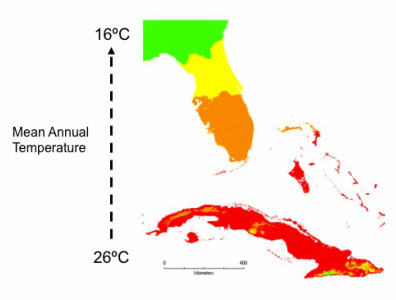 We are studying the ecological and evolutionary changes that occur when lizards live in cities, including their structural habitat use, thermal microclimate use, and foraging behavior. We are particularly interested in whether altered urban environments change how natural selection operates compared to natural habitats. We are currently focusing on Anolis lizards in Miami, Florida and San Juan, Puerto Rico. We use phylogenetic and population-genetic analyses of molecular variation to reconstruct the history of invasions. From where do introduced populations originate? What is the route of colonization? What is the propagule pressure? Did introductions occur from single or multiple native-range sources? Answering these questions provides a framework for testing hypotheses for invasion success and determining how evolutionary mechanisms (i.e., admixture, natural selection, and random genetic drift) interact to produce genetic and phenotypic changes during invasions. Introduced species face numerous environmental changes during invasion in order to successfully colonize, establish, and expand their ranges. Shifts in climate, microhabitat, predators, and prey are inevitable. How introduced populations respond to these environmental changes is key to understanding invasion success and the general response of natural populations to human-mediated global change (i.e., climate change and urbanization). We use comparative studies of phenotypic variation, field and laboratory experiments, and environmental niche modeling to understand the relative importance of adaptation, phenotypic plasticity, and neutral processes for driving phenotypic divergence during introductions. Adaptation can happen on a timescale relevant for ecological processes. This relatively recent revelation in evolutionary ecology forces us to consider how both deterministic and random processes in evolution influence interactions within and among species. 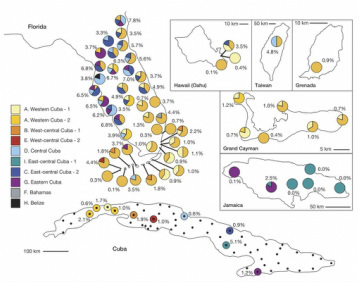 Using small islands in the Bahamas as experimental units, we ask how multiple evolutionary forces (i.e., founder effects, gene flow, natural selection, and population bottlenecks) interact to influence evolutionary trajectories for morphological traits and how trait evolution feeds back to influence food web interactions. The main players are the brown anole, green anole, curlytail lizard, and a host of spiders, insects, and plants.